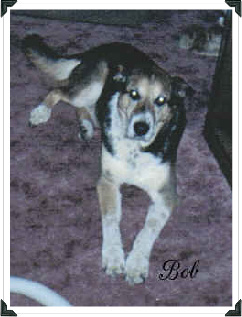 We helped ^Bob^ to the Rainbow Bridge on October 28, 2004, where he was warmly greeted by ^Lucky^, ^Granny^, and all the other furbabes we have lost. He is buried in his grandmother's backyard, not too far from where we buried ^Lucky^. We miss ^Bob^ terribly and his passing has left a huge void. We adopted him from our veternarian's office after someone had apparently abandoned him there. Its obvious that Bob is Australian Shepherd and German Shepherd, but we have no idea what other breeds he may be mixed with.. His ears are too large for his head and his 'elbows' are deformed which causes him to lay with his front legs spread out from his sides. He has developed arthritis in his elbows, has hip dysplasia, and he's almost all the way deaf. He's very intelligent, affectionate, and always quite eager to please. We adore him! I'd pick up my keys and you would know. "A ride in the truck, oh please take me!" I'd try to explain, so you would know. I'm going to work, there's no place to play." All of those reasons and so many more. Waiting in the window, watching for me. As ever before, you came to my side. No gleam in your eyes, you sensed what I felt. My mind was racing, "This was our last ride. My whole body shook, my eyes filled with tears. This time you left me.....and I wanted to go.